Clinical nurse navigators are registered nurses who specialize in oncology. Acting like a compass, they provide education and guidance to patients and their loved ones throughout their journey with cancer. Nurse navigators support patients as they move through the full continuum of care, from detection and diagnosis to treatment and survivorship. Acting as a patient/family advocate in navigating the health care system. Addressing patient’s and caregiver’s concerns about the disease and its treatment and providing support throughout the course of treatment. Providing one-on-one support and assistance in the coordination of services for patients and their families. Evaluating the patient and directing them to the appropriate resources for clinical, emotional, and financial assistance to prevent problems and overcome barriers throughout the course of treatment. Working collaboratively with the healthcare team to provide education to the patient, family members, and caregivers throughout the continuum of care. Linking patients, families, and caregivers with appropriate community resources. Developing and maintaining working relationships with community agencies, healthcare organizations, and other providers to promote a broad base of support for patients and families. Facilitating team support of identified patient and family needs through ongoing communication with clinic team members. 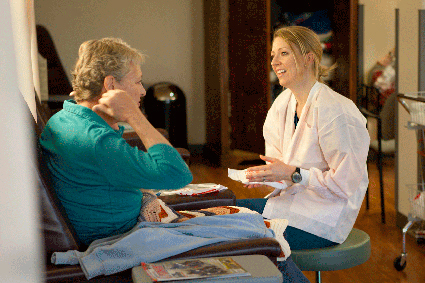 Serving as point of contact for patient, family, and other caregivers throughout the full continuum of care.